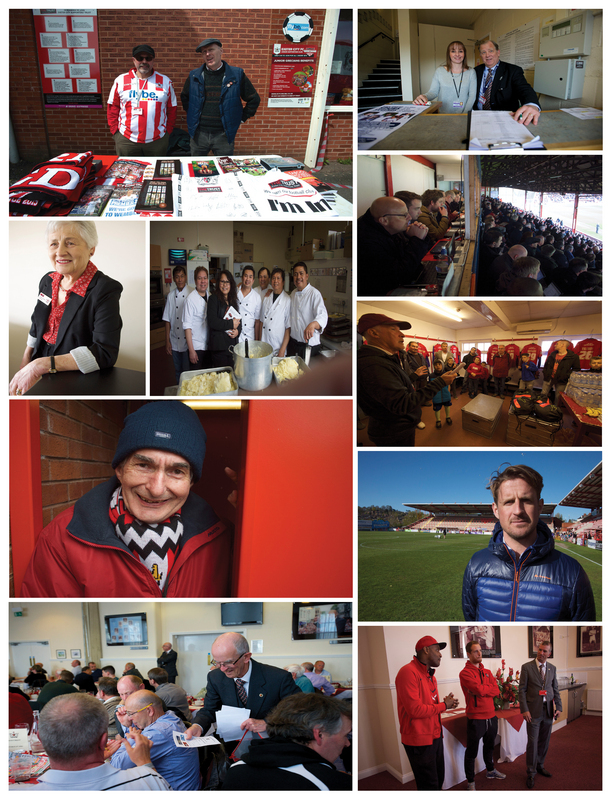 The Exeter City Supporters Trust, owners of the club, and today’s amazing range of supporter groups are following in a long tradition of supporter organisations and their associated fundraising and volunteering. Throughout the history of the Club, supporters – our Park People – have organised, fundraised and volunteered to help. They have also seen a few games along the way. It is thanks to them that they can still follow the team they love. It was way back in November 1911, not long after City had turned professional, that a Supporters Club was first mooted. Mr H. A. Devenish, previously a director of QPR, announced he was to set one up and asked for interested fans to get in touch. The first meeting of the Supporters Club was held on 24 January 1912 with Devenish as Chairman and Mr Middleweek secretary. They quickly set about a programme of social events, the first of which was a whist drive and dance at the Queen’s Hall. Amazingly one of the first donations to the new Supporters Club was £5 from Plymouth Argyle. The Football Express commented ‘The gift was very welcome, and the more appreciated coming from the quarter it did’. Supporters at this time were already getting used to frequent calls on their money. Collections were regularly made at home matches for the ‘Summer Wage Fund’ to help the club retain and pay players in the close season. But right from the start there was a community spirit too. A big collection was made at the home game against Crystal Palace on 20 April 1912 in aid of the ‘Titanic Fund’. The Supporters Club organised a collection in October 1913 to raise funds on behalf of the Senghenydd Colliery Disaster Fund (439 miners had been killed following an explosion). There was supporter democracy too. In the run up to the Plymouth Argyle game in 1911 around 2000 fans stayed behind after a reserve match. Chairman Michael McGahey said the supporters could decide on the pricing. The fans voted to keep normal prices for those buying tickets in advance but agreed to a doubling of the cost for those turning up on the day. Away travel continued to be organised and on 10 January 1914 the Grecian army enjoyed a thumping 4-0 win away at Portsmouth in the FA Cup. The Express and Echo reported ‘One member of the City’s Supporters Club, forgetting all about his duties as a ticket checker, rushed from the grandstand steps on to the field as the City team filed off, and threw his arms around Pym’s neck with all the fervour of a parent welcoming home some wayward prodigal’. After the First World War the Supporters Club continued to actively help the club with financial support for ground improvements. For example in 1920 they gave £180 for enclosing the pitch with iron railings and in 1925 funded the covering of the new ‘Flowerpot’ Terrace (later known as ‘The Cowshed’). The Supporters Club also continued to promote events. In 1921 they put on a programme of sports at St James Park with a series of athletics races for attractive prizes (the winner of the one mile handicap received a 6 cup tea set; silver-mounted fish eaters for the 440 yards). The Club met every Monday at 8pm in the committee room under the Grandstand. The annual subscription in 1921 was a shilling. The Supporters Club folded during the Second World War but its spirit was still there when a plea in 1945 for volunteers to help restore the ground was made. The Express and Echo in July said that St James Park was in a deplorable state. ‘The big bank, overgrown with weeds, is like a jungle...the war years have left many ugly trade marks on a playing pitch which in peacetime was lawn-like at this time of year’. Help was needed and the Echo reported that ‘A member of the old Supporters Club has offered his services every night of the week. In so doing he has set an example to others who are enthusiastic for the return of big Soccer to Exeter. Other volunteers will be welcomed.’ It wasn’t long before a new supporters group was being formed. The Grecians Association was in place for 1945, the Express and Echo describing it in August as ‘an active company which came into being a few months ago, chiefly through the efforts of Mr Norman Kendall, doyen of local football enthusiasts who has been elected President.’ Mr Les Seward was the Secretary. The new Association was quickly organising events including a bank holiday fete at the ground to raise funds for the Football Club. Opening the fete the deputy Lord Mayor expressed the hope that ‘the City club would recapture the glories of the early thirties when the team made a sensational cup run and also came within an ace of winning promotion’. By 1955 the Association had raised around £12,000 for the club, the latest contribution being a £1000 cheque presented at the annual dinner of their Executive Committee at the Royal Clarence Hotel. One project that gained support was funding for the new floodlights, which made their debut at a friendly with Plymouth Argyle in front of 8,130 fans on Monday 9 March. The money was much needed, as throughout the decade there was a constant need for funds. Indeed on 3 April 1957 an official Appeal Fund was launched. It struggled to make headway and one of the City directors was reported as saying he was dismayed at the lack of help given by former directors in comparison to the many hundreds of ordinary City supporters. In 1964 a separate Supporters Club was formed but within 13 months it had agreed to merge with the Association to form a 7500 strong body. The new Supporters Club was quickly active and in 1968 set up a Junior Section ‘to try and do more for the younger supporter at St James Park’. One of the early successes claimed was ‘the atmosphere created behind the goals on match days’. Fundraising continued to be a core role and one popular event was ‘The Great walk’. The walks – to complete as many sponsored miles as you could manage in 4 hours- took place in the early seventies. On 12 April 1970, for example, around 130 supporters, the Club Secretary Ian Tarr, the Manager John Newman and many players took part. Other initiatives included the invitation to pledge to pay a minimum of a shilling for each goal City scored and a big Christmas draw. Women were a target for recruiters to the Supporters Club with the 1970/71 handbook saying ‘It has been quite noticeable that female support at St James Park has grown considerably during recent seasons, so if any of you young or elder ladies would like to help us, help City, we would be delighted to welcome you on the Committee’. Female supporters had been present from the start. In 1912 ‘Rover’ writing in the Football Express said ‘I have often had reason to congratulate the City Club on the loyalty of their lady supporters’. ‘Rover’ did, however, recall one regular female fan who when asked on arrival at a match to subscribe to an appeal fund tossed her head with the remark “This rotten club is always begging”. The club had appointed its first female Company Secretary in 1964 and in more recent years there have been female Directors, including Frances Farley and Elaine Davies and Club and Supporters Trust Chairman, Denise Watts. If ever a vibrant supporter organisation good at fundraising and encouraging volunteers was needed it came in 2003 when the Club was relegated to the Conference, massively in debt and in the last chance saloon. Riding to its recue was the Exeter City Supporters Trust, formed in 2000. With a wave of support from fans and the community it became the major shareholder in the Club. Supporters Direct development officer Dave Boyle said “As so often, the supporters stepped in when nobody else would, and with their club in crisis. They have steadied the ship so far and will be doing all they can to ensure the club doesn’t die. It proves yet again that the future of clubs lies with their supporters, not sugar daddies’”. The Supporters Trust, with 3000 plus members, have now owned the Club for over 13 years and in so doing has had to invoke many of the fundraising and volunteering efforts of the past but on an even bigger scale. Many of these really resonate with campaigns of old. Money is still raised for players’ wages through the 1931 Fund which helps pay for City’s Number 31. Major appeals have been launched including the ‘Red or Dead’ scheme, which saw hundreds of fans pledge a minimum of £500. Support for ground developments go on including the ‘Pitch in for City’ appeal to help lay a new pitch and the ‘Light up the Park’ fund to secure new floodlights. Initiatives like ‘Golden Goal’ fund much needed projects. Volunteering has reached unparalleled heights. Legendary work parties transformed St James Park and the Cliff Hill training ground at Cat and Fiddle. Fans pick up litter after games. They prepare and serve meals for the players. They do a hundred and one jobs around the club. Each year the Trust organises a thank you party for the volunteers. The spirit of giving is also still here. A bucket collection for a local charity or cause takes place at every home game. Support is given to local community initiatives like Exeter Foodbank and the Exeter Dementia Action Alliance. And it isn’t just the Supporters Trust. There is a remarkable array of supporter groups all helping the club in a myriad of ways. The Supporters Club (continuing a tradition that goes back to 1912) organises travel to away matches running at least one coach to every game. There are age related groups like the Junior Grecians and the Senior Reds and organisations as diverse as the Exeter City Disabled Supporters Association and the ExEC 100 Club. An increasing number of localities have supporter groups including the North Devon Grecians, East Devon Grecians, Great West Grecians, East Midlands Grecians, the Exeter City Exiles and many others. There is even a Norwegian Supporters Group.